These two ingenious storage designs are some of our most popular photos on Houzz. The first, by @Zugai Strudwick & @Henarise in Australia has been saved to more than 120,000 ideabooks. 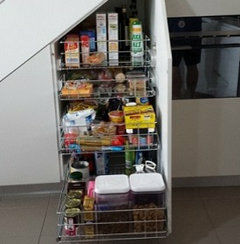 The pull-out shelving solution was designed by @Ben Herzog (USA) and has been saved more than 160,000 times. 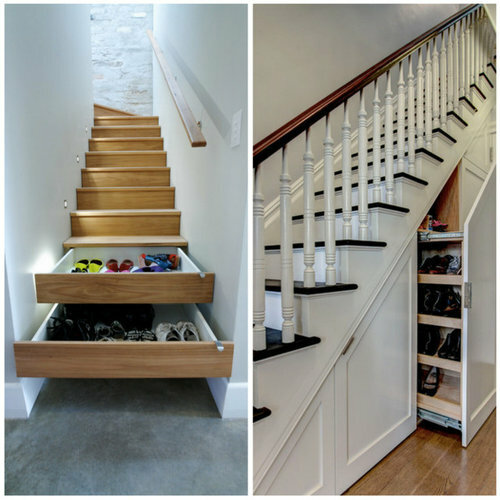 Which of these two kinds of shoe storage would you prefer under your stairs? Also, it wouldn't have the inconvenience of 2 people trying to use the stairs and storage simultaneously. it would probably be more sturdy, as the stairs themselves are not hollow. it seems more ergonomically friendly. Luke, Luke, Luke....haven't you learned by now that I ALWAYS need an "other" button. I keep mine (my shoes) in my closet in the bedroom. I'm totally baffled by these solutions, clever though they may be. If you have stairs like the Zen with no external area then that is a great idea! If you have the older stairs with some side access then that is a great idea, too! I wish I HAD stairs to put my shoes so I would stop tripping over them in my tiny bedroom! Sturdiness isn't a problem - if you look under most modern staircases, you'll find that there is nothing under the treads - the vertical bits joining stairs aren't really structural at all. I love Brooklyn - but it does rule out carpeting your stairs. I agree with our mate chook. Zen just way too dangerous, imagine carrying a basket of washing down the stairs and some one leaving a stair drawer open. I can't believe it is allowed. Cupboard is not just safer, it doesn't require labeling. Who wants to open 17 drawers to find the one pair of shoes? Also you can deodorize the whole lot at once in the cupboard. POLL: Where do you keep your shoes? Help with shoe storage for new home!